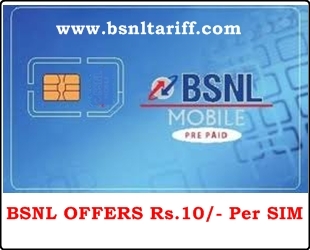 Public Sector Unit (PSU) Bharat Sanchar Nigam Limited (BSNL) has announced discount offer on SIM cost under GSM 2G Mobile Services across Tamilnadu Telecom Circle for limited period as promotional basis. The Competent Authority of Tamilnadu Telecom Circle has reduced price for SIM cost to Rs.10/- for activating 2G Mobile Connections in Tamilnadu Circle for period of 15 days. This offer Reduced SIM cost Rs.10/- will be applicable for Customers who enroll into any of the 10 (Ten) prepaid plans (Lifetime, Per second, Per Minute, General Plan, Anbu Jodi, Student Special, Jai Jawan, Roam Free, Nesam Gold and BSNL simple plan Rs.100). Reduced SIM Cost offer will be applicable for both New customers and MNP (Mobile Number Portability Customers) under 2G Prepaid Services. Customer on the specific demand of 3G SIM card (USIM) will be charged Rs.59/- (128K) per SIM. The above offer will be implemented and with effect from 19-07-2013 to 31-07-2013.